SHAMOS has much capability to solve forensic questions concerning solar positioning. Often in traffic accidents the sun's position, shadows, light and darkness becomes a factor in the accident. The shadow of the overpass in the photograph, became an issue in a court case. The lawyers wanted to know preciesely where the shadow was at the exact date and time of the accident. Solarnetics was asked to determine the shadows position and its width relative to the intersection. Solarnetics determined this by tracing the shadow edges across the intersection and marking them on the pavement with blue spray paint. 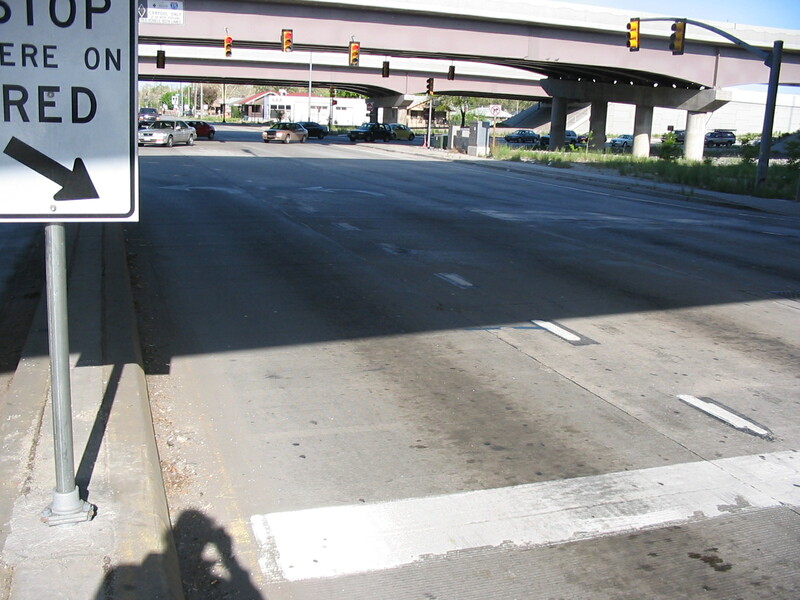 Then when the sun was casting a very similar shadow across the shadow edge survey marks for the date of the accident, a picture was taken on another date to illustrate what the driver saw as he or she entered the intersection. In this way the shadow edge could be reconstucted and a photograph of that shadow could be entered into evidence as a fair approximation of the scene as experienced by the driver on the actual day of the accident. However Solarnetics understands that information entered into evidence requires the utmost care, attention to detail, and validity that is practically possible. Therefore Solarnetics will take every opportunity to verify its work. In this case verification was totally possible given the time needed for the sun to recreate the exact light and shadow conditions of the accident. The picture at the top of this page was taken in the spring of a different year while the second picture was taken six months later in the fall at the exact time and date of the accident to demonstrate the accuracy of the original survey. It must be stated that the sun and therefore its shadows must return to the same places each year. There are small variations in this repeatability each year because of the four year leap year cycle. 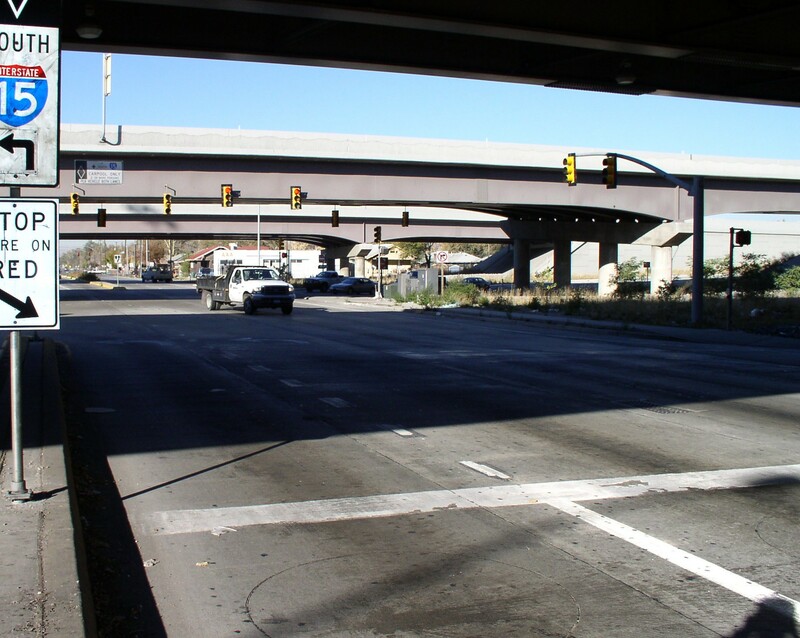 A comparison shows that the actual shadow of the overpass is very closely reproduced. The change of season can be seen by the sign post's shadow position. Its shadow in the second picture demonstates that the sun was much further south. At the time of survey a blue paint marker was sprayed on the pavement which can be seen in the first and third pictures. This marker was neccesary in order to take the first picture as the shadow edge overlay the blue marker to reproduce the position of the shadow on the day of the accident. In the third picture is a closeup of the shadow edge on the date of the accident. Right below the white dash line (i.e.the lane divider) is the blue smudged paint marker that was painted there six months earlier. This picture was taken just 30 seconds off of the actual accident's time. The only way to improve on this timing, which is quite unnecessary, is to return to the scene of the accident on the same date in the same year of the four year leap year cycle. While this kind of accurcy and double checking is overkill in other applications, in the field of forensic science it is very necessary. Any uncertainty could hurt too many people and result in large damages. Solarnetics employs validity checks in all the work it does. These are not difficult with some attention to methods and reduncency. Once a site has been surveyed twice and both surveys come out to be the same, barring some kind of methological error, correct results are assured.